Enter Ringdroid. 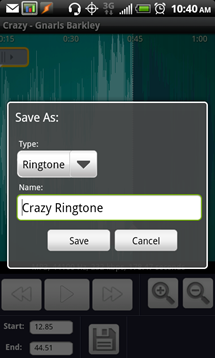 Ringdroid's sole purpose is to let you take an existing music file, crop it exactly how you want it, and then save it as either a ringtone, an alarm, or a notification. 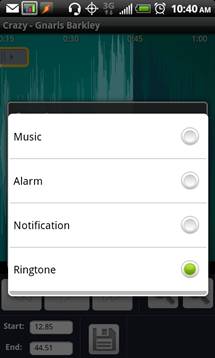 The end result - the newly created sound shows up in the corresponding dropdown, ready for all that waking up, notifying action you can throw at it. Fugu in the comments tips of another method: "It is also possible just to create directories in the root of your SD card called “notifications” and “ringtones” and just place your mp3 files there that you want to use." I've confirmed this to be working, at least for ringtones. First, you need to download Ringdroid. You can do it by searching the Market, clicking the QR code below from your mobile, or scanning it with the Barcode Scanner app. Now that you have the media files on your handset, fire up Ringdroid. 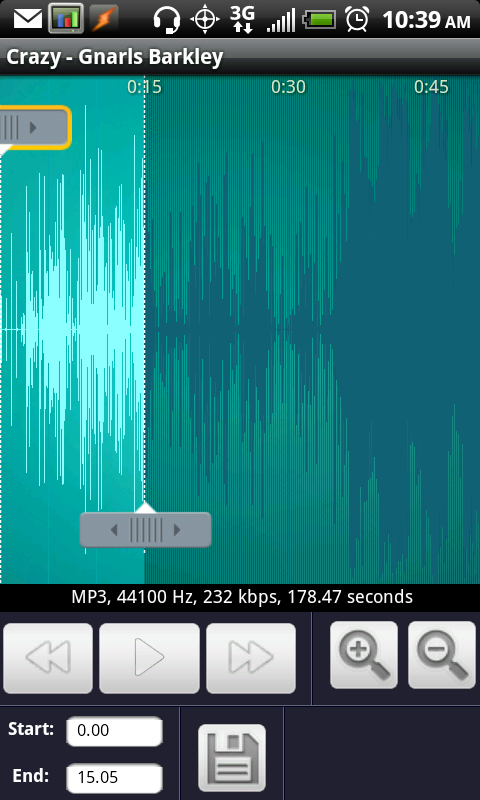 You will see a simple list of what should be all of the audio files found on your device. If you don't see yours, press Menu, and try the "Show All Audio" option. 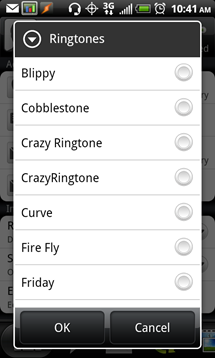 Select the audio file you want to use for making a custom ringer, notification, or alarm sound. 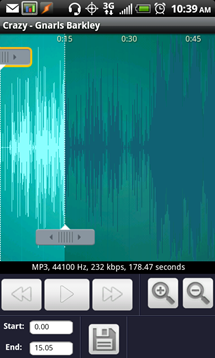 You will see the wave graph making it easier to find exactly where you want to start and end your custom sound. You can play, zoom in and out, move the sliders around, or specify exact start and end times manually. Once you're satisfied with your selection, press Save. 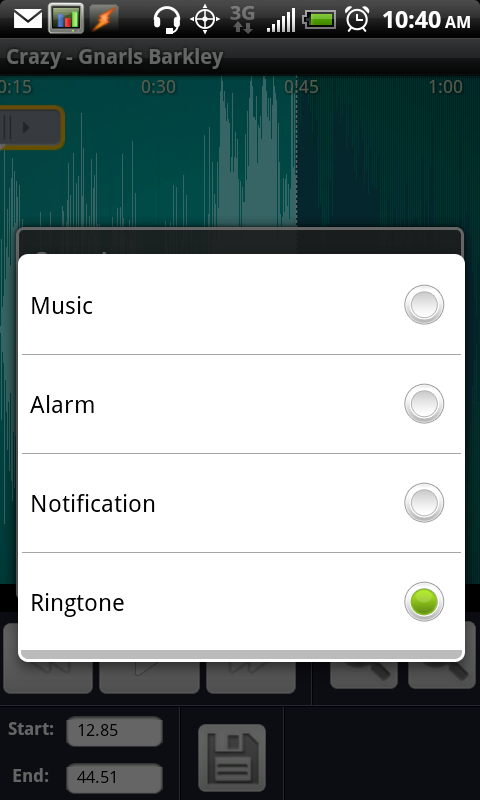 In the popup, select Alarm, Notification, or Ringtone to have the newly created sound show up in the appropriate menu. Optionally, on the next screen, you can pick "Make Default" or "Assign to Contact" without having to edit settings or contacts. Note: if you want to assign a ringtone to a contact later, open the contact up and click Ringtone (at least that's what it looks like in HTC's Sense). 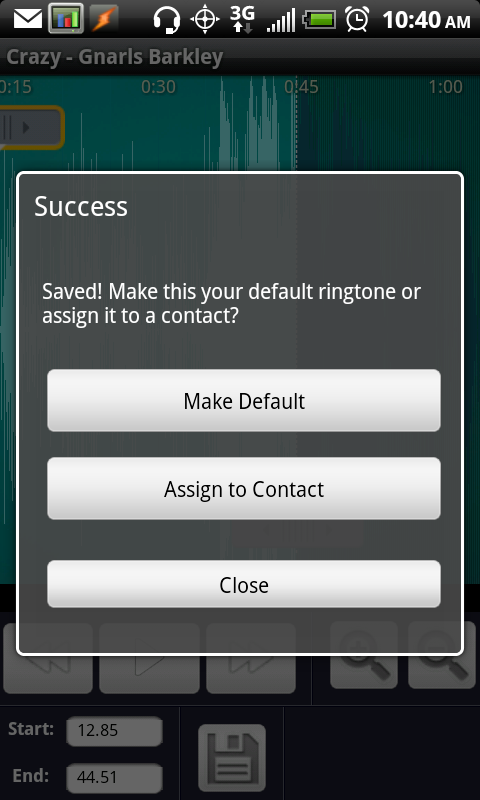 Now, I have to point out that there seems to be a bug in the current version of Ringdroid (2.4) which could create a duplicate ringtone with slightly different spacing (as you can see in the screenshot below). It's not a big deal and I'm sure will be fixed soon. Also, for the curious, the newly created media files go to sdcard root/media/audio. If you ever want to remove the custom sound you've created from whatever list it went to, go to the above location using something like Astro and remove the media file. 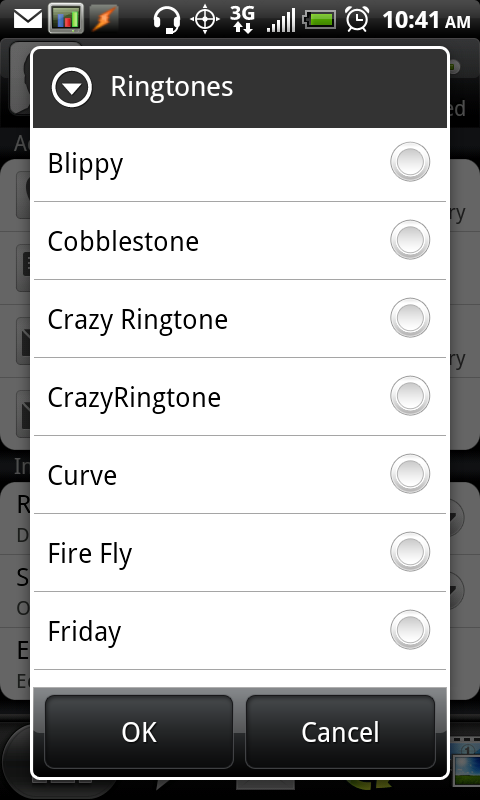 It took a reboot to refresh but after that, the ringtone I've created finally disappeared.